In March of 2014, the Indiana State Board of Education approved the adoption of new academic standards for Social Studies. These new standards went through a rigorous review process. Classroom teachers, higher education, and social studies organizations were involved in the review process. In addition to the new academic standards, the Indiana State Board of Education also approved the adoption of Content Area Literacy Standards for History/Social Studies (Grades 6-12) in April of 2014. These standards are to provide guidance to social studies teachers on expectations for integrating reading and writing skills into their classrooms. 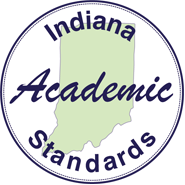 The following documents specifically list the social studies Indiana Academic Standards for each grade level or content course. These standards are listed by grade level in grades K-8 and by content area in grades 9 – 12. These standards provide guidance to social studies teachers in grades 6-12 on expectations for integrating reading and writing skills into their daily instruction. These Teacher Resource Guides have been developed to provide supporting materials to help educators successfully implement the social studies standards. These resources are provided to help teachers in their work to ensure all students meet the rigorous learning expectations set by the Academic Standards. Use of these resources is optional. The Vertical Articulation documents illustrate the significant connections between the standards across grade levels. Administrators and teachers are encouraged to use these documents to facilitate cross-grade level discussions. These documents provide guidance and illustrate the correlations between the current Indiana Academic Standards for social studies (2014) and the previous standards from 2007. Teachers are encouraged to use this document as an instructional support tool.